Finite Element and Boundary Methods in Structural Acoustics and Vibration provides a unique and in-depth presentation of the finite element method (FEM) and the boundary element method (BEM) in structural acoustics and vibrations. It illustrates the principles using a logical and progressive methodology which leads to a thorough understanding of their physical and mathematical principles and their implementation to solve a wide range of problems in structural acoustics and vibration. It is written for final-year undergraduate and graduate students, and also for engineers and scientists in research and practice who want to understand the principles and use of the FEM and the BEM in structural acoustics and vibrations. It is also useful for researchers and software engineers developing FEM/BEM tools in structural acoustics and vibration. Finite Element and Boundary Methods in Structural Acoustics and Vibration utilizes authors with extensive experience in developing FEM- and BEM-based formulations and codes and can assist you in effectively solving structural acoustics and vibration problems. The content and methodology have been thoroughly class tested with graduate students at University of Sherbrooke for over ten years. Noureddine Atalla is a professor in the Department of Mechanical Engineering (Université de Sherbrooke). He is also a member and past director of GAUS (Group d’Acoustique et de vibration de l’Universite de Sherbrooke). Professor Atalla received an MSC in 1988 from the Université de Technologie de Compiègne (France) and a PhD in 1991 in ocean engineering from Florida Atlantic University (USA). His core expertise is in computational vibroacoustics and modeling and characterization of acoustic materials. He has published more than 100 papers and is also the co-author of a book on the modeling of sound porous materials. "…the analyses presented begin with well-known fundamental equations and follow a logical progression to the final solutions. 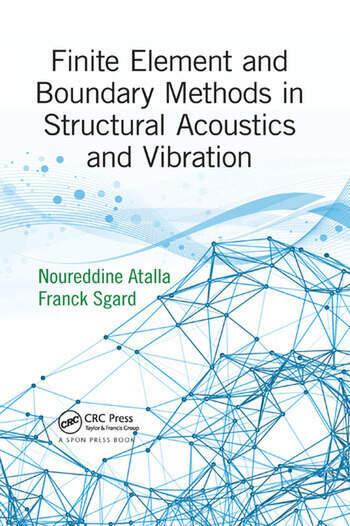 …The book provides a thorough treatment of the theory that underpins FEA and BEA as applied to the solution of vibro-acoustic problems and as such it is a valuable text book for graduate students majoring in acoustics or vibration." "The approach serves well for researchers of all levels in vibro-acoustics, since the examples provided cover a full spectrum of applications, as well as coupling the examples with the constraints and convergence aspects of FEM that often cause the user to not use the FEM successfully." "This book paves the way for the curious researcher on their often meandering journey. …the authors encourage the reader to think about the various simplifications and assumptions that have been made in the case examples presented; an essential stepping stone for both the junior and senior researcher. This book fills a great need to provide the essential basis for anyone who may be required to use finite element methods and especially boundary element methods in structural acoustics." "The book aims to introduce the basic concepts of both the FEM and BEM solution approaches, and the first chapters include some basics of acoustics and vibration. This wide scope poses a challenge in terms of depth vs coverage and some details are by necessity not covered in depth. The book has a distinct value as a point of entry to the covered computational methods and the various aspects involved in their application. However, to be really useful, the reader should have, or be prepared to acquire, a quite thorough understanding and background knowledge in engineering mechanics, mathematics, linear algebra, acoustics and elastodynamics."